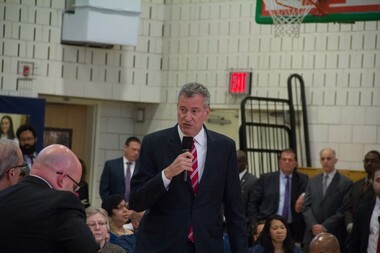 Mayor Bill de Blasio spent more than two hours fielding quality life concerns from Staten Islanders at his first town hall meeting in the borough. NEW YORK — Mayor Bill de Blasio struggled to bounce back from a wave of investigations and bad press over the weekend — as reports surfaced accusing his office of using straw donors to avoid campaign finance contribution limits and alleging that the office hid its knowledge of a botched real estate deal that shuttered a nursing home on the Lower East Side. The beleaguered mayor, who is already scrambling amid reports that the U.S. Attorney's office is investigating his office's relationship with two tarnished Brooklyn businessmen accused of bribing high-ranking NYPD officers, has felt mounting pressure on a host of other fronts. De Blasio's camp is reportedly reeling from a leaked memo from the state Board of Elections that emerged late Friday accusing de Blasio's office of carrying out "willful and flagrant" violations of campaign finance limits in their fundraising efforts to back Democrats in two 2014 state Senate races upstate — and suggesting the behavior was severe enough to warrant criminal prosecution — according to a memo first obtained by the Daily News. The mayor's office hit back, calling the January memo "politically motivated" and unfounded, vowing to investigate who leaked the memo and defending de Blasio's actions as being in keeping with campaign rules, according to reports. The memo was revealed as the Board of Elections came under fire for purging more than 120,000 Brooklyn voters off its rolls. The mayor also offered $20 million in incentive funding to the beleaguered agency to improve its performance, according to reports. In addition, new details emerged in the Mayor's Office's handling of a nursing home on the Lower East Side now slated to become luxury condos. While de Blasio's office has repeatedly denied any prior knowledge of Allure Group's intention to convert the Rivington House nursing home at 45 Rivington St. to luxury condos after purchasing it from the city — his team not only knew about the plans, they also tried to reverse the move a month before it became public, the New York Post reported. After the city allowed Allure to change its deed in exchange for $16 million in November 2015 — paving the way for the nonprofit to sell to a luxury condo developer for $116 million — a de Blasio staffer reportedly offered to return the $16 million in an unsuccessful bid to reverse the deal, the Post reported. The mayor is also facing criticism over his universal pre-Kindergarten push — which he has hailed as a cornerstone of his agenda. According to the New York Post, De Blasio allegedly used the mayor's Fund for the City of New York to bypass city regulations and pay pre-K providers who were unqualified to get city contracts through official channels. Four day care programs in Brooklyn, Queens and Harlem reportedly got $1.36 million from the city through the mayor's Fund for the City of New York, instead of waiting for approved contracts, in what critics are calling a way to dodge regulations. The city is now applying for retroactive contracts for the providers, which are no longer providing pre-K under the city's plan, to reimburse the "loans" from the mayor's fund, according to the Post.